Trec Vit. 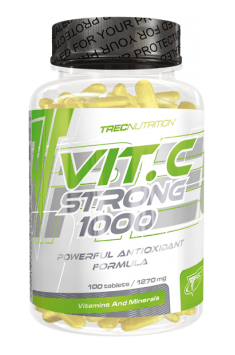 C Strong 1000 is a vitamin dietary supplement that contains vitamin C with addition of citrus bioflavonoids and zinc. This product presents strong antioxidant properties, supports body functioning and improves immunity. Its complex formula efficiently fights free radicals, and its beneficial effects will be appreciated especially by people who want to prevent frequent infections, and strengthen their bone and joint systems. Zinc and citrus bioflavonoids act synergistically with ascorbic acid prolonging its activity in the body and increasing its antioxidant properties. Vitamin C - one of the most popular vitamins. It is essential for proper functioning of the organism on several levels. It is responsible for the production of proteins and hormones, and it supports the immune system. This vitamin is the most popular compound commonly known as antioxidant. Its antioxidant properties protect against the harmful effects of free oxygen radicals that develop during an intense workout or in people who consume high calorie meals. Free radicals may damage cells, causing their complete destruction what favours ageing processes and speeds up the appearance of wrinkles. Numerous publications report on the important role that vitamin C plays in infection prevention. An additional supply of this vitamin in the autumn-winter period can strengthen the immunity and protect against illness. Vitamin C is essential for synthesis of hormones - adrenaline and noradrenaline. These hormones through the vegetative system affect body mobilisation and they may also increase immunity. To synthesize collagen it is necessary to modify two amino acids - lysine and proline. The modification is possible thanks to an enzymatic transformation, and vitamin C is necessary here. Vitamin C is a coenzyme of proline and lysine hydroxylase, which are responsible for attaching hydroxyl groups to these amino acids. Collagen is a structural protein found in connective tissue, tendons, ligaments or bones, so vitamin C supplementation is ideal for people who do strength trainings and want to strengthen their joints. Vitamin C is also responsible for the strength with which the teeth are held in dental alveoli, so its deficiency, that leads to impaired collagen synthesis, may result in scurvy, which is manifested by tooth loss. This vitamin improves the digestibility of some minerals in the gastrointestinal tract. One of these minerals is iron, responsible for haemoglobin synthesis and red blood cells structure. Its deficiency may lead to anaemia and can manifest as chronic fatigue or problems with concentration. Citrus bioflavonoid extracts are colourful organic compounds obtained from bitter orange (Citrus aurantium).They include i.e. hesperidine. Similarly to vitamin C, bioflavonoids have antioxidant properties. They may also protect against peptic ulcer disease, and are able to bind heavy metals such as copper and lead. Bioflavonoids have a positive effect on cardiovascular system, strengthen vascular walls, regulate blood pressure and prevent cardiovascular diseases. Zinc is an essential micronutrient in a diet. As a cofactor of over 200 enzymes it is responsible for numerous metabolic processes. It contributes to the development of healthy bone structure and supports the immune system. This element significantly influences cardiovascular system: regulates both heart rhythm and blood pressure and can prevent atherosclerosis. Zinc is well known for its positively effect on hair and skin condition. It has been proven that it is very effective in fighting acne. Summing up, Trec Vit. C Strong 1000 is a dietary supplement that supports both, the functioning of the body, and the immune system. High antioxidant potential of this supplement enables effective protection against free radicals. A solid dose of vitamin C enriched with zinc and citrus bioflavonoids provides additional health benefits: strengthening the cardiovascular system and improving skin condition. Vit. C Strong 1000 100 tab. The recommended daily dose is 1 tablet after the main meal. Wash down the preparation with 300 ml of water. The increased need for vitamin C has been observed among elderly people, smokers, those who abuse alcohol and use drugs. The recommended daily dose of vitamin C should range from 100 to 200 mg and it is usually supplied with a diet. However, if we deal with cold or infection and want to support our immune system, we need a higher dose – it has been observed that the dose of 2 g (2 tablets) per day may decrease the symptoms of cold or shorten its duration. It should be borne in mind that vitamin C is soluble in water and it is best to use it with a lot of water. Fillers - cellulose, cross-linked cellulose gum; anti-caking agents - silicon dioxide, magnesium salts of fatty acids; tablet coating (dyes - titanium dioxide, tartrazine, binders - hydroxypropylmethylcellulose, polydextrose, talc, maltodextrin, coconut oil). It ensures total breakdown of allergenic proteins, such as gluten or casein.